Currently Infinity:Battlescape is in Alpha and does not have an ingame keyboard/input configuration option. The pre-launch menu has an keyboard/input configurator though. As well as select two controllers. 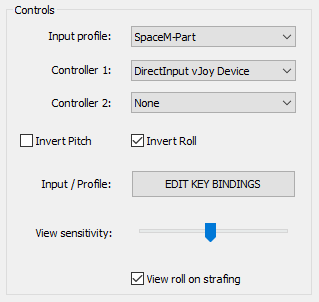 With "EDIT KEY BINDINGS" one can edit the selected profile and add/modify keyboard mouse and the selected controller 1 and/or 2 buttons and axis to the available functions. It is also possible to manually go in and add new profiles by creating/copying .xml files in a specific folder. These profiles can then be selected in the pre-launch configuration menu. This post serves the purpose as a repository of all working options as well as general guide how to make these configuration files work for your desired setup. .xml edit or added in here will affect the game and be selectable. .xml edit or added in here will not affect the game! Each profile xml file can be edited to customize the key/events bindings. - Keys and SecKeys are respectively the primary and secondary (alternate) keys which are bound to the event. It can be a single key, or a list of key combination separated by "+"
Ex. : Keys = "LeftCtrl + X"
It is also used to check for conflicts, or that the mapped keys correspond to the type of intput (ex. : if you specify an "axis" type but provide a binary key instead). - Data is an event-specific data. Ex. : the "SwitchOvercharge" event by default cycles through overcharge modes. But if you specify Data="Weapons", it willll switch to weapons overcharge no matter what the previous mode was. -> in detection utility, should arrows ignore buttons? - the default value when alt-tabbed is zero. 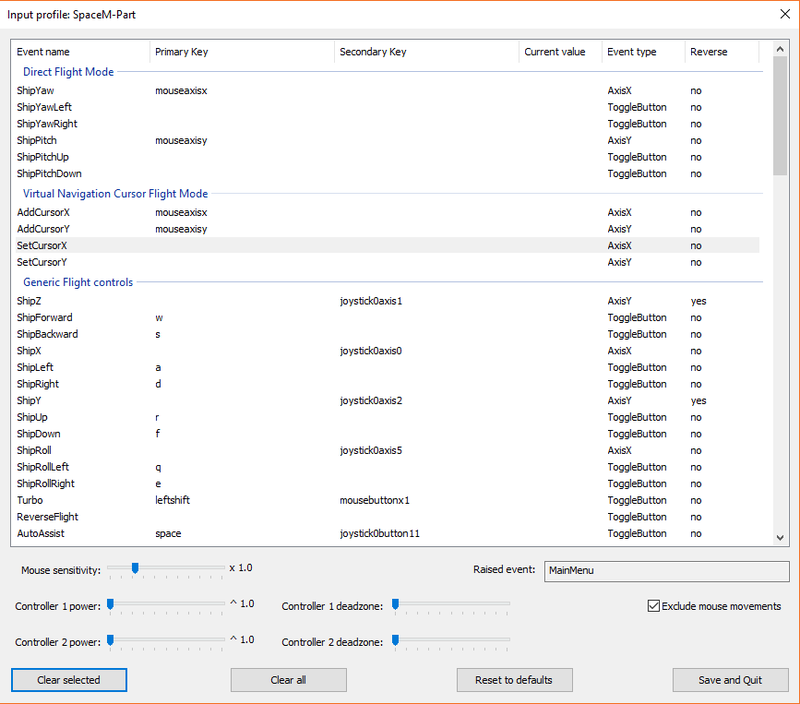 This can get remapped to 0.5 for the SetTargetSpeed throttle for example, therefore when alt-tabbing your ship accelerates to 50% ! The following were found experimentally and are only of indicative value. Other controllers might have different axes/buttons assignment. Values range from -1 to +1 for axes (left to right, top to bottom). (like in screen coordinates, top-left of the screen is 0,0). So you might have to reverse some vertical axes in the input mapper. Note that triggers are technically axes, but they give values in the 0 to 1 range, so they can be used as buttons in the input mapper too. There is a number of events that can be configured in the .xml files. The Input/Profile configuration lists most relevant events. There might be some that may be not listed. The majority of available events are already used/defined in the default profiles. Please feel free to add any from previous versions. You can see in the “readme.txt” that one can configure two different Input devices beside Keyboard and Mousse. The game launcher lets you select both of them though, the first one, even if you would use “Joystick1…” Keynames it won’t work due to this. There is a workaround though. Using third party software like Universal Control Remapper. You can have multiple devices feed into one “Master Device” and use that device as your Pirmary “Joystick0” device. Your “Master Device” needs to be a virtual one, so sadly you can’t just map all your devices to one of your hardware devices. With vJoy you can create virtual devices. Start “Configure vJoy” from the Start menu or open “vJoyConf.exe” in the installation directory. Make sure “Enable vJoy” is checked in the lower left corner. Configure your vJoy device with the ammount of features you need. If you are not sure select tab 1, add device if it’s not added yet, select all axis, enter 15 into “Number of Buttons” and leave everything as is. Add Device or Apply after you are done. Use Default Profile or create a new one with the “Add” button. Start remapping your Devices by Selecting “Plugin Selection” > “Remapper (Axis To Axis)” / "Remapper (Button To Button) etc. Configure the plugin. Give it a clear name to differentiate it. Do this for every axis and every button. With UCR running you can now create a configuration .xml for Battlescape the usual way. 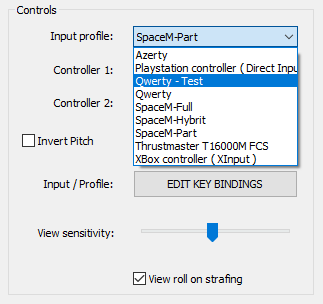 When starting the game make sure to select the “DirectInput vJoy” device as your “Controlller”. This post is set as a wiki post in order for anyone to be able to update the information.